Offered by Belmont since 1989, the Building Preservation/Restoration (BPR) program has become one of the most recognized programs of its kind in the nation. 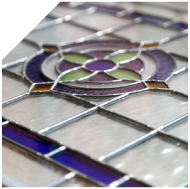 With a unique combination of theoretical and hands-on learning, Belmont's program creates the opportunity for its students to combine in-class learning with actual restoration projects. The BPR program places students in an active restoration experience-allowing students to apply critical thinking skills in situations that they will face throughout their careers. At Belmont, you will learn by doing. You won't just study historic preservation; you will apply learning to historic buildings that are in need of restoration and repair. The program offers experiential learning every day of every week. If you desire to learn how to protect historic sites, Belmont has the program for you. Dave Mertz has served as the Director of the BPR program since the program's inception in 1989. He is a graduate of Kansas State University with a Bachelor's and Master's degree in architecture, as well as a certificate in Regional & Community Planning. 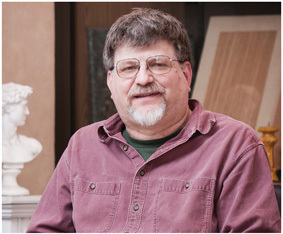 Mertz, who lectures frequently on technical aspects of historic preservation and community revitalization, has served as Chair of the National Council for Preservation Education and as a board member and vice-president of both Heritage Ohio and the Ohio Preservation Alliance, Ohio's two state-wide preservation non-profits. He has also served on the advisory board of the Preservation Leadership Institute of the National Trust for Historic Preservation and the editorial board of Preservation Forum, the nation's scholarly journal on Historic Preservation. He currently serves as vice-president of the Preservation Trades Network, an organization that honored him with their 2014 Jim Askins Lifetime Achievement Award. Additionally, Mertz has authored numerous articles in national publications relating to trades education. Cathleen Senter is a veteran of historic preservation projects while working for architects in Ohio and West Virginia over the last 29 years. Her knowledge of the conservation of historic materials and hands-on approach to building investigation makes her a unique team member in the preservation field. She majored in Architecture at Ball State University with a minor in Construction Management. She is a graduate of the Building Preservation/Restoration program at Belmont College and received the John J. Shannon Alumni Emerging Leader Award from Belmont College in 2014. For the past six years, Cathie has been collaborating with building owners and architects as a preservation consultant while teaching in the Building Preservation/Restoration program at Belmont College. She served for nine years as a Board member and President of the Canton Preservation Society. During the crucial years of the revitalization of downtown Canton, Cathie served on the Standards and Code Committee for Canton Tomorrow. Ms. Senter acted as the chief reviewer for the Facade Grant program on behalf of the City of Canton for two years. She was named the Stark County Citizen of the Year in 2003 as well as receiving the Historic Preservation Excellence Award (Akron chapter) from the American Institute of Architects. 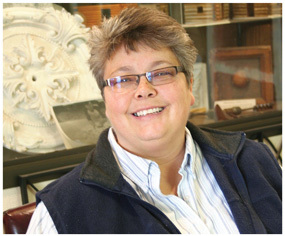 Cathie currently sits on the Board of Directors for Wheeling National Heritage Area Corp. and the Design Committee for Downtown Wheeling Inc.
As a BPR student you will receive many opportunities to challenge your skills by completing hands-on projects in the field. 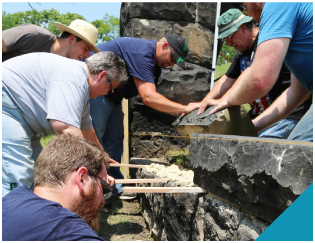 Graduates of the Building Preservation/Restoration program have found employment with the National Park Service's Preservation Training Center, private preservation contractors, statewide non-profits, and historic house museums such as Frank Lloyd Wright's Fallingwater, Graceland, Montpelier, Stratford Hall, Mount Vernon, Lyndhurst, and Monticello, among others.